2 tables in VIP just not enough to play and have fun...all we do is go from lobby to lobby looking for a new game to play.....Then I think of the poker tournament, what mass confusion that will be.....I come here to play poker, laugh with friends and have fun....now we are lucky we can even sit near each other, we we're never in the same VIP room....Lets make VIP Great Again, move the ring poker tables to 5K. then 5k players can play either 1k or 5 k whichever they want...people who really like the game will play there, like us in VIP. You have plenty of room to the side of 5 k. Lots of room for more tables there. It cuts down the amount of time we play, by going lobby to lobby looking for games....therefore it cuts down on the amount of chips we use... what does that say? It means we are not buying chips as often.....that in itself should being back the VIP tables to 4. You will have to see a difference in that alone....Please consider making the change back to the way it was.....Everything was fun, everything ran smoothly. Why change that?? As I've mentioned in other threads, Ring/cash game poker has been the most requested game variant since launch, so we were anticipating a fairly large percentage of players to want to try out the tables. We will definitely be keeping an eye on how much use the tables get over the next while, and adjust the layouts accordingly. No worries, that's what I am here for. and I am glad to hear you guys have formed such a tight community. To answer your question, there are a few factors that we will keep an eye on to gauge the number and type of tables. Part of it is how much use the tables get, although that's definitely not the only factor and shouldn't stop anyone from playing on those tables. Part of it is also if players are abandoning the tables as soon as a tournament style table opens up. Part of it is feedback from players here on the forums. Obviously if people are just using it as a stop-gap until a game they prefer becomes available, the number of tables should be adjusted. There does always seem to be a very strong reaction when we make an update, whether that update is good or bad, or something that players have specifically asked for (as in this case). So we'll give it a bit to settle, we'll make sure we're listening to everyone's feedback, and then make any necessary changes once we have more data. If you won't make changes to fix the obvious problem you created by switching 25k and 100k poker tables over to lower cost ring games. Then please give us a way to find lobbies with open tables. I have no interest in spending my time loading the same lobby over and over again. Scrolling through a friends list that starts you with offline players to hop from person to person. And spend most of my time trying to play a game. Never haveI ever fought so hard to try and playa game. This was a social game. Now its a train wreck. I haven't played a poker game in over 30 minutes because I can't find one. Not alone can I ever play a poker game with friends anymore. You gave ruined the ability to play with friends. You gave made it impossible for their to be any type of community. The only way to play with friends is wait for an open table sometimes 20 minute waits. And hope that everyone of your friends gets a seat. Not saying get rid of ring poker. But your implementation of it is ruining the very great game you created. Roll it back, adjust it, do something to fix it before you lose your community of players who love this game you made but have turnedit into a frustrating game of russian roulette to actually ever play. Do you have suggestions on how I can actually play a game? If not please update your loading screens as this is incredibly boring and frustrating. At least give me a reward for seeing 1000 load screens in 1 day. Heres an option... how about you let us rent or buy a room, how some games allow people to have servers in others games. You can have your two vip 25k tables and 2 ring tables in your vip lobby and ill have four 25k tables in mine. Lets see whos lobby gets used more? Rent out a lobby for a season for a base price. Let the owner of that lobby decide the types of tables. 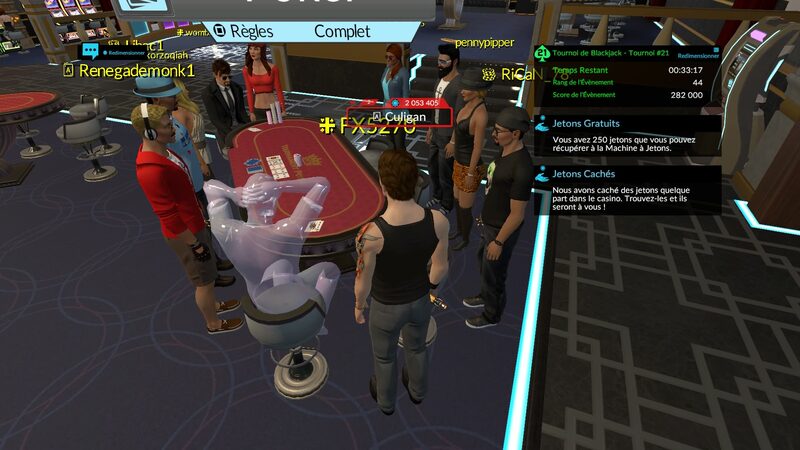 This would allow for people to still maintain their community of friends and fellow casino players. Give them a safe place to play, giving the owner the option to ban certain people trolling and behaving inappropriately. Reduce the amount of reporting and issues your staff would look into and even provide you with another revenue stream. It would also resolve this issue of lobby hopping, not finding a game, the reliance of fixing this issue is on you. Why not give the opportunity to us, let your players decide the fate of the lobbies. Or wait.. here is another option. When you are going to roll out a new game and are unsure how to do that. Why not ASK your community for ideas on how? Remove the bar and couchs and add a table there? Why not ask for feedback and ideas first instead of rolling the dice and seeing what happens? And having to tell people. Well we are going to waitit out and see what happens for a bit and hopefully you guys are patient and stick it out. Please log in, you go and try to find a lobby, go experience the frustration first hand. Apologies for the difficultly finding a table to play on currently. We will adjust the tables in the next update. Thank you for taking the time to read them and respond. Is there a date or ETA for the next update? A lot of people appear to be waiting for the adjustment to the tables to come out and avoiding poker or looking elsewhere for entertainment. Much appreciated. Wondering if there is an update here? I find myself spending half of my login time waiting on the vip tables to open up as the ring tables sit there empty. Lol, why is the "most" requested game ALWAYS empty? Also, why are all the poker cliques complaining so much about this game? It seems perfect for all the people that want to simply hang out all day and night playing poker. Is it because you have to spend your own money now? I think the problem with the Ring Poker in its current format, from a personal standpoint, is the starting chip amount when you first sit at the table. Players in VIP are used to wagering 25k when they sit down at a Tournament Poker table, but for Ring Poker the starting amount is only 5k. When they play a TP game in the High Roller room, they are used to wagering 100k, but for RP it is only 20k. Furthermore, the current blinds for the VIP & HR Ring Poker games are too low in my opinion. Raising those I think would create more interest for the Ring Poker. I have no interest in playing RP in its current format because I find myself folding until I get good down cards, and when I do get good down cards, going all-in to maximize the return for having a possible good hand. Winning a couple thousand chips at a time, to me, is a waste of time. In addition, the experience points, or what I like to call "Crown Points" aren't always awarded when you win a hand in RP. I've read posts from DL that say that the Ring Poker format is the most requested game to add to 4Kings, but does that mean that it is as popular or more popular than Tournament Poker? From a personal standpoint, as well as the reactions I've read from other players, obviously not. The other night I was hopping from the VIP, High Roller, and 5k poker rooms and they ALL had the same thing in common. All of the Tournament Poker tables were full, with players standing around waiting for games to finish so they can join in the "mad dash" to find a seat, and all of the Ring Poker tables empty collecting dust. If I could change the way TP and RP are presented to 4Kings, I would either create a separate room for Ring Poker with multiple starting chip amounts, ie. 5k, 25k, 50k, 100k, and with higher blinds, or have 1 RP table in VIP and High Roller and 1 or 2 RP in 5k. However, the starting chip amounts need to be raised regardless to create any interest in Ring Poker at all. I also think the developers of 4 Kings need to visit a casino. When people go to a casino, they don't go hoping to win $10 or $20, or even $50. They go because they are hoping to win a jackpot. Something they can tell their friends and family about. That is why they keep coming back. If people feel they really can't win anything at a certain casino, why would they want to go? To see flashing lights, eat a buffet, and maybe have $50 more in their pocket on a good night but most of the time losing money? Why do they have new cars and motorcycles in the casino? Why? Because they offer them as prizes for jackpots. Why do people play Lotto? Because they are hoping to buy a ticket that will make them a millionaire. That is why Crazy 8s and Coggs are the most popular slots on your game, because they are the only 2 that you can really win anything on. The rest are a waste of time. I love playing your game. I've spent money on chips and clothes for Doobie because I love playing it so much. Do you know what I don't love? Waiting 20 minutes to join the only poker tables that you can really win any chips at, and sometimes not even getting on the table when it does open up. Especially when I have a short window of time to play the game on some nights. I hope my suggestions were helpful and that something is done to change the current format of your game. I know most of your players would agree from the reactions I've been reading on the chat boxes. This is DoobieBlazzin saying, "Smoke em if you got em"! Well said. Only problem is,,, they don't want the casino 2 be fun. Only tedious and expensive. i can’t play tonight because there are always around 10 players waiting and they have a better ping. So... its been quite some time since I last saw a post in this thread by anyone from digital leisure. A few posts from new people. How can you ignore them? How do you expect people to see a reason to communicate on here when you aren't engaging the people who are trying to reach you? It seems digital leisure is greatly out of touch with their own game. Appears you are in no rush to fix the poker tables which has caused issues in every room you put them. Maybe you guys need social platform training? Its insulting to ask for feedback and then when its given you can't be bothered to answer. Even just a "hey we hear you, we are working on it and will update you when we can thanka for your patience". But you can't seem to manage basic communciation. No ETA on an update. People are waiting 60 mins+ to play a poker game. Ask yourself, how long could you maintain patience and still have the urge to play a game of poker after waiting that long? Average working gamers only play 2 or 3 hours a night. You expect them to spend half their gaming time waiting to play 1 poker game? This whole situation is so ridiculous its a wonder how your game is even still played. Give your community some hope, give us a reason to be patient. Show you are listening and reward those for their patience. Or for crying out loud fix the damn tables. What do you want screenshots of lobbies with 20 people waiting for tables? Tell us what you need to justify fixing this ridiculousness and im sure we will go above and beyond. Question is.. will you go above and beyond for us? There lies the answer to how long will 4 kings casino be alive for. Just wait till one of these other games can fulfill the thirst for casino games. It will be a shame to see 4kings die. You have our assurances that we will adjust the number of tournament poker tables in the next update. We are working diligently on creating the next update but there are a number of technical changes that will be part of next update that we need to work through before we can push the update live. When we have a more definite date we will share that with you. If progress goes as planned this coming week then we should have a better idea toward the end of the week. Apologies that this is taking some time but it is the nature of the beast. I vote ring poker off the Island!! Any idea when the tournament tables will be making a comeback in VIP? It's getting tiresome having to constantly fight to get on a table. Thanks! Yes, I agree Mousie and can we please get a Que system for poker after you remove the Ring Poker please?